It’s now September, which means that most kids have already started school. That means new backpacks, dreaded homework assignments, and the school cafeteria! Wait… do kids still eat lunch in the cafeteria? The last time I did was probably in 1998, so things may have changed a bit! In the next few weeks, I’ll be bringing you some childhood nostalgia in the form of re-vamped — and dare I say delicious? — recipes from those days of eating from plastic lunch trays with your friends by your side. There were a few dishes served in my school’s cafeteria that I actually didn’t despise. Of course desserts are always high on the list (they’re also kinda hard to mess up), so it’s no wonder that the cherry crisp served at my school was actually top notch. Tart-sweet cherries covered with a crunchy layer of brown sugar and oat topping was always welcome on my lunch tray. This version is pretty damn close to the one that my school served, so when I tried it, I got a nice helping of back-in-the-day to go along with this totally stellar cherry crisp! Pour the cans of cherries into a large strainer set over a large bowl. Reserve 1/2 cup plus 3 tablespoons of the water from the cherries, and discard the rest. Dump the cherries into the bowl and set aside. For the crumble topping: In a medium sized bowl, stir together the flour, oats, brown sugar, cloves, and salt. Add the chunks of cold butter and either mix by hand or with a pastry blender until the entire topping mixture looks damp and will clump together when squeezed, with no large chunks of butter remaining. Evenly scatter the crumble topping over the cherries in the baking dish, making sure to go all the way to the edges of the pan. Press down lightly on the topping to make sure it’s in an even layer. Bake the cherry crisp in the preheated oven for 28-30 minutes, until the topping is golden brown and the filling is bubbling. Let cool slightly before serving, or chill entirely before serving. 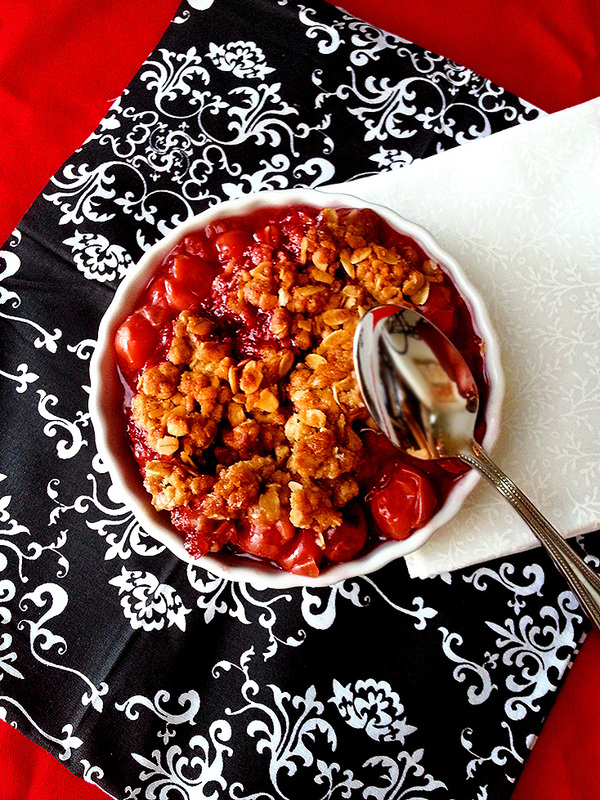 This cherry crisp is perfect for dessert, but it also makes a mighty fine breakfast! I haven’t tried it this way yet, but I can imagine it’d be excellent with vanilla ice cream or fresh whipped cream. Myself, I just like it plain in a bowl with nothing on the side but a big spoon. Totally brings back the memories, man. Enjoy! Love this series (and everything you make)! These were all my favorites too. I actually can smell the cafeteria cleaner and taste the accompanying chocolate milk when I read this. As always, love your blog!